Antarctigo Vespucci ist das gemeinsame Projekt von Jeff Rosenstock (Bomb the Music Industry) und Chris Farren (Fake Problems) mit verträumtem Strand-Pop-Punk. Die Handschrift von Jeff Rosenstock hört man deutlich raus: sehr poplastige Songs mit Ohrwurm-Melodien und viel Charme! 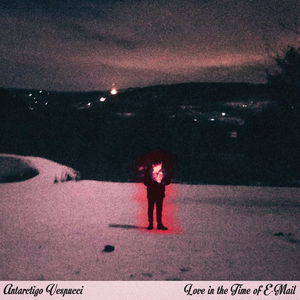 Antarctigo Vespucci is the brain-child of DIY stalwarts Jeff Rosenstock (Bomb the Music Industry) and Chris Farren (Fake Problems). Their 'dreamy beachy pop-punk' just being the outcome of two soulmates hanging out together. Love in the Time of E-Mail, their second full length record, is coming out 26th October via Big Scary Monsters. In 2013, Chris Farren faced an uncomfortable certainty: his band was breaking up. For the last eight years, the one constant in his life had been Fake Problems, the indie punk group he had started as a teenager and successfully steered for almost a decade. In that time the scrappy group of Floridians had put out two albums on LA label SideOneDummy, toured all over the world, and even landed a few songs on TV. But now, that was all over. Not knowing what else to do, Chris went to New York. The idea was to collaborate, to find writing partners, something the musician had never done before. After a few days in the city he ran into his friend Jeff at a party. At the time, Jeff was fronting the band Bomb the Music Industry!, a Brooklyn based punk collective that Fake Problems had often crossed paths with on tour. The two decided to give writing together a try.